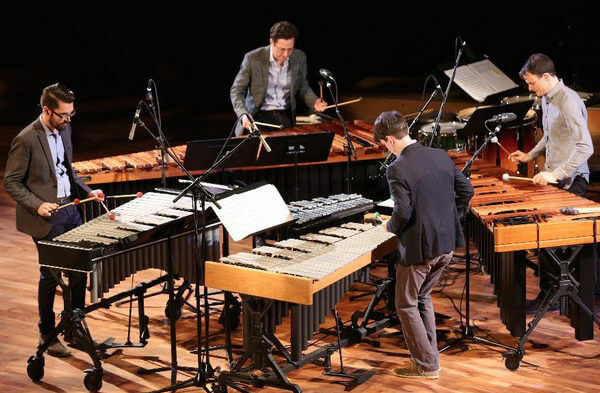 When Third Coast Percussion’s latest album “Third Coast Percussion – Steve Reich” was nominated for a Grammy award, NIU had reason to celebrate. NIU School of Music alumnus and faculty member Dan Nichols (B.A. ’05, M.M. ’08) is the recording engineer and alumnus Matt Ponio (M.M. ’15) is the assistant engineer on the album that will compete in the Best Chamber Music/Small Ensemble category during the 59th Grammy Awards on Feb. 12, 2017. Nichols, who earned a Master of Music degree in multiple winds performance in 2008 is the university’s head of Recording Services. He is also the founder and CEO of Aphorism Studios, Inc., a multimedia production company geared towards hi-fidelity, unified audio and video multimedia documentarian services that handled the “Steve Reich” recordings. The nomination is particularly special for Nichols, as it is a culmination of his partnership with the internationally acclaimed ensemble. The Grammy awards will air Feb. 12, at 7 p.m. on CBS.